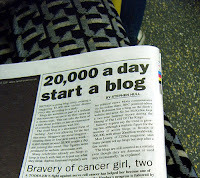 Over the past few weeks I have had a lot of conversations with my colleagues about the benefits of blogging. I was interested to see that blogging was the topic of tonight's #edchat too. It seems that educators who blog are being seen as early adopters of something that will soon become mainstream. Because of this it is our responsibility as educators to encourage our students to blog, and therefore as teachers and principals we should be modeling the practice we want the students to engage in. Tonight on #edchat the question was asked: if most of us agree blogging is beneficial then why is it the exception rather than the norm in school? I have noticed recently that blogging has become part of the culture of many of the great international schools, for example ISB and NIST where all classes have blogs and where the administration are adding to their blogs weekly. In other schools such as YIS, a scope and sequence for blogging is already underway and in UNIS Hanoi an international teachers' blogging alliance has formed. 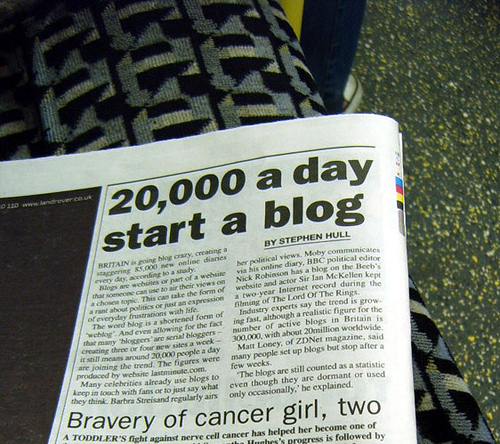 But despite the fact that many of my colleagues are interested in blogging, there is only a handful of us actually doing it. The reason for this was mentioned on tonight's #edchat: admin buy-in is needed and it is the job of the tech savvy to sway the admin. It's sad but true: until teachers see the admin understand the benefits of blogging and are comfortable with blogging themselves and encouraging of the teachers and students who blog, they just won't take the risk themselves if they think it will provoke disapproval. Blogging is writing. It is a tool where connected writing happens. The beautiful thing about a blog is that the conversation doesn't end, it can be ongoing and grow. The learning isn't ending with the piece of paper that has been turned in. I agree, without administration buy in, it is hard to convince of the powers of blogging. I am presenting this very truth to administrators tomorrow, I hope it is a message they receive!